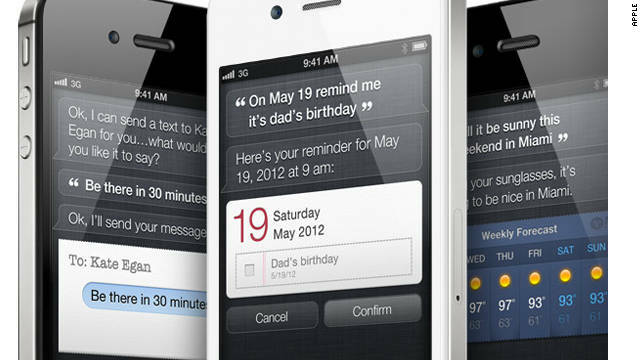 Siri, the voice-enabled "personal assistant" on the iPhone 4S will listen and talk back on a range of issues. The iPhone 4S — Apple’s newest creation — quietly went on pre-sale at 12 a.m. on Friday. The homepage of the company’s website, however, remained a dedication to the company’s co-founder, Steve Jobs, who died on Wednesday after a history of pancreatic cancer. The phone, which has been panned by some critics who say it’s more of a facelift to the iPhone 4 than a new product, features a faster dual-core processor and a camera with 8 megapixels of resolution. It also has a "humble personal assistant" named Siri, which responds to voice commands and talks back to you. Apple’s new CEO, Tim Cook, unveiled the phone on Tuesday, a day before Jobs’ death was announced. The phone’s price ranges from $200 to $400 with a two-year wireless contract. It’s available on AT&T, Verizon and, for the first time, on Sprint’s network. The iPhone 4S goes on sale in stores on October 14 in the following countries: United States, Australia, Canada, France, Germany, Japan and the UK. The new iPhone will be available in 22 additional countries by the end of October, Apple says. Pre-sale orders can be placed at Apple’s online store, as well as on AT&T, Verizon and Sprint’s websites. All of those brick-and-mortar retail stores also will carry the phone, along with select Apple-approved retailers — which as of Friday morning had not been listed by Apple. BestBuy was making the phone available for pre-order Friday on its site. Walmart’s site said only that the iPhone 4S was "coming soon."